TIERRA VERDE — A condo development on a barrier island off Tierra Verde that was stalled during the recession is moving back to the front burner with different owners. Four Tierra Verde businessmen are planning Sunset Pointe at Collany Key, a cluster of 120 condos priced between $900,000 and $1.3 million. Tierra Verde, Fl, June 29, 2015– Collany Key Development I, LLC, today announced plans for its new luxury waterfront condominium project to be located at 650 Collany Road, Tierra Verde Florida. The first thirty (30) unit building will be five stories over parking with units ranging in size from 2,721 to 2,939 square feet. Pre-sales for this first building are now under way. 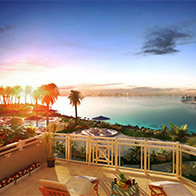 Each unit will include three bedrooms, three and one half baths and will be located directly on the Gulf of Mexico. When complete the project will include a total of 136 residential units. Collany Key is located directly adjacent to the Shell Key Wildlife Preserve owned and maintained by Pinellas County. The gated community will feature a waterfront resort style heated pool and spa area, fitness room, outdoor kitchen and gathering area, sunset pavilion, and meticulously landscaped nature trail surrounding the property. “ This is without question the most desirable parcel of waterfront real estate on the entire west coast of Florida”, said J. Mark Stroud, Manager of Collany Key Development. “This long awaited project represents the first new community on the island in over twelve years and we very much look forward to becoming a member of the Tierra Verde Community”. Curts Gains Hall Jones of Tampa is the architect of record and KAST is the contractor for the development. Construction is expected to begin in the fourth quarter of 2015; the sales center has just recently opened for business.